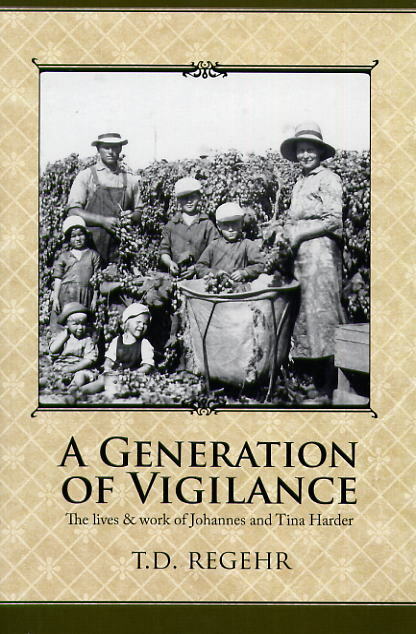 The other evening, I attended the book launch of A Generation of Vigilance (CMU Press, 2009), the biography of Johannes and Tina Harder by Ted Regehr. Harder was leader of the Yarrow MB Church, a congregation that grew from some 200 to well over 900 members, the largest Mennonite Brethren church in Canada at that point. For several decades, he was the most influential MB leader in B.C. The launch was rather sparsely attended, but it was a fine evening in spite of the few of us. Regehr strikes me as both gentle and suave, and I enjoyed hearing him read and talk about the project. I’d skimmed the book when it came into the MB Herald office for review and enjoyed that too. (Said review, by Abe Dueck, will appear in the November issue). Regehr explained how he got involved in the project. Missionary/anthropologist Jacob Loewen “felt he’d contributed to Harder’s death and wanted to make amends,” so began collecting material for a biography but was unable to finish because of ill health. Regehr had “high regard for Jake,” he said, and curiosity too, “to examine some of the same forces, in a place where I knew no one, that had troubled me in Coaldale [Alberta, where I grew up].” Regehr accepted the invitation of the Yarrow Research Committee to do the biography and enlarged it to include Tina. In the discussion that followed, someone asked about parallels between Janz and Harder. Regehr explained that Janz was older and not in church office when “the wineskins burst.” (That focussed on his successor at Coaldale, J.J. Siemens.) But for Harder, it happened during his lifetime; “many things to which he’d devoted his life collapsed.” He felt he’d failed. Harder had become increasingly insistent on immersion for membership, and when the MB conference agreed to widen the category, he went out of the meeting with a terrible headache and told J.B. Toews, “If I was younger, I would start another church.” It puzzles, that he was so adamant on this, for his wife Tina was only re-baptized after they came to Canada, and in his family of origin, some had joined the MBs and others not. His brother became a General Conference (now called Mennonite Church Canada) minister. A puzzle. Or are these explanations? This entry was posted in Books, Mennnonite Brethren and tagged B.B. Janz, biography, J.B. Toews, J.J. Siemens, Jacob Loewen, Johannes and Tina Harder, Ted Regehr, Yarrow by doradueck. Bookmark the permalink. I wish I could have attended this launch. I remember the Harders from my childhood, and am looking forward to reading the book as well. Hi Susan, It will be interesting to know what will feel “familiar” and what will surprise you. I just finished reading the book. I’d love a coffee time with others in Winnipeg who have read it. I’d certainly be up for that, especially to hear former Yarrow folks’ reactions. The “vigilance”is a common theme of that generation of MBs, and I would if it’s had enough historical analysis, at least in terms of contemporary church concerns. My condolences to you Dora on the death of your father. It brought back many memories of my father’s death. He also was ravished with Alzheimer’s.At the time I was living in Ontario and unfortunately I did not see him during his last few weeks. I now often wish I could have been there to say my goodbye.